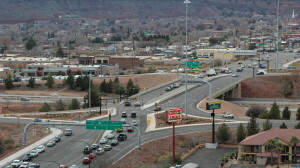 ST. GEORGE — As a part of an overall project to widen Interstate 15 to three lanes between Exits 8 and 10, a highway underpass will be built at the northern end of Mall Drive to connect East Red Hills Parkway and Red Cliffs Drive. 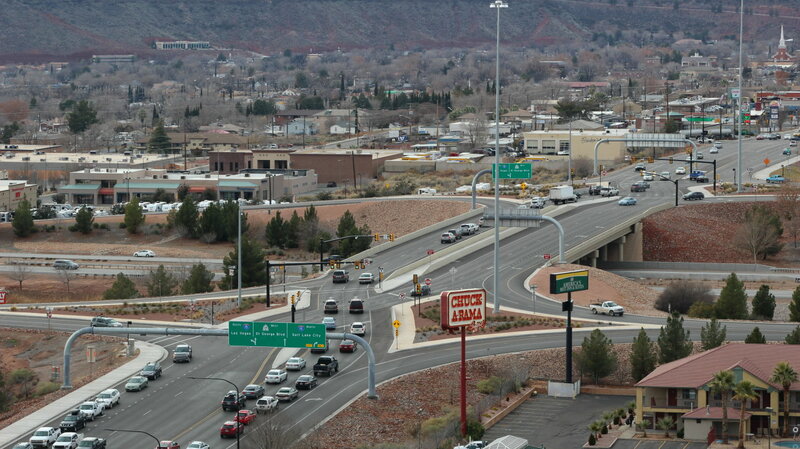 The City of St. George and the Utah Department of Transportation finalized a cooperative agreement last month that helped clear the way for the project. Officials anticipate the underpass will help alleviate traffic congestion at the St. George Boulevard and Exit 8 interchange and the more notorious Green Springs Drive and Exit 10 interchange in Washington City. UDOT Project Manager Kim Manwill said city officials approached UDOT about building an interchange as a part of the highway widening project. As a part of one of UDOT’s latest projects along the I-15 corridor through Washington County, Manwill said, a new lane will be added to both the northbound and southbound lanes, just as has been done with portions of I-15 north of Exit 16. The ultimate goal is to have three lanes running down toward the state border. “Eventually, you’re going to see three general purpose lanes sometime in the future all the way from the port of entry up past milepost 16,” Manwill said. Widening the 2-mile stretch of highway and building two support structures for the overpass, along with providing some general improvements, is expected to run close to $21 million, Manwill said. The city’s contribution to the project is around $5 million, said Cameron Cutler, director of the City of St. George Public Works Department. The city has split the work into two separate projects to help speed up the process, he said. The project is currently in the design phase, with UDOT aiming to put the project out for bid by March. UDOT officials hope to begin construction by May and have the project wrapped up by the end of the year. Another potential project on I-15, set north of the Green Springs Drive interchange, proposes an interstate exit at milepost 11. This project is currently undergoing a feasibility study, Washington City Mayor Ken Neilson said. The proposed exit is also being looked at as a way to lessen the congestion around the Green Springs Drive interchange. The concepts of the Mall Drive underpass and proposed milepost-11 exit were both on display at the 2015 Dixie Regional Transport Expo. The 2016 transportation expo is set for Feb. 9 at the Dixie Center St. George, and will feature continuing and future transportation projects being undertaken by UDOT, the county and municipalities. In additional to highway and road projects, elements of mass transit and active transportation are also featured at the expo. The public is invited and encouraged to attend, as well as give input on the various projects displayed. The geographical errors in this article just boggle my mind. In the first paragraph, you state the interchange will connect East Red Hills Parkway and East Red Hills Drive. The correct street names are East Red Hills Parkway and East Red Cliffs Drive. In the second paragraph you list St. George Blvd as being at the Exit 10 interchange for I-15. It’s Exit 8. C’mon STG News, where’s your editor to do some proof reading on the articles before they’re published? My understanding at this point, Law24, is you were correct and the errors have been corrected. Your points are well taken – please accept my apologies.